Contact System Improvements to request a quote for bringing this course to your site! Why Do the Same Problems Keep Coming Back? Errors happen daily. Fortunately, our work system safeguards usually prevent them from becoming product recalls, sentinel events, workplace fatalities, or environmental incidents. We do our best to help prevent these problems, but all too often, they keep coming back. Why are our fixes failing? Why can’t our people stop making mistakes in the first place? Two key problems exist. First, our work systems are essentially designed to allow some amount of errors to both be produced and get through to the next process. These errors are produced daily, even though we may not measure them. We all too often blame the person, or worse, live with the problem instead of changing our work systems to drive behavior change. Second, when problems do occur, we attempt to prevent them in the future with a weak set of improvement strategies. Some fixes are more effective at changing human behavior and minimizing risk than others. Some fixes work temporarily, but they are difficult to sustain over time. Fortunately, there are proven best practices that can be used to both identify, and fix, the systemic root causes of human error and equipment failure. How Can I Escape Reactive World? Three things have to happen in order to escape reactive world, and it is common for all three strategies to be in play at the same time. The first thing you have to do is start effectively analyzing and finding the true root causes for those process errors and defects that do occur. Since everything cannot be fixed at once, you will have to decide how to triage these problems from a risk mitigation perspective. More importantly, you will have to let go of the notion that human error is a root cause that can be easily fixed with reminders, warnings, and punishment. Second, you will need to ensure that effective fixes are being sustained for the systemic problems your root cause analysis efforts are uncovering. This begins by making sure that effective fixes are being put in place in the first place. Overall value is lost as limited resources are used on weak improvements. Lastly, you need to enhance your abilities to anticipate and safeguard potential causes of human error. Sustaining these strategies will help you will spend a smaller percentage of your time in reactive world as time progresses. How Can the ‘Best Practices in Mistake Proofing and Corrective Action Writing’ Workshop Help You? This workshop explores the common types of work process and safeguard design flaws that contribute to human error, including weak corrective actions. It gives you a coach, and a practice field, for learning to write more effective, and sustainable, corrective and preventive actions. Finally, this workshop gives you over 100 best practices you can use to more effectively, and proactively, ‘mistake proof’ your workplace by fixing key work process and tool design flaws. What does it take to become mistake proof? How adequate are your safeguards? Connect with me to stay in touch with me and to receive great best practice-focused content that will help you improve your teams and organization. Kevin McManus serves as Chief Excellence Officer for Great Systems! and as an international trainer for the TapRooT® root cause analysis process. During his 38 plus years in the business world, he has served as an Industrial Engineer, Training Manager, Production Manager, Plant Manager, and Director of Quality. He holds an undergraduate degree in Industrial Engineering and a MBA. He currently serves as a Judge for the Malcolm Baldrige National Quality Award, and has served as a national Examiner for eighteen years. 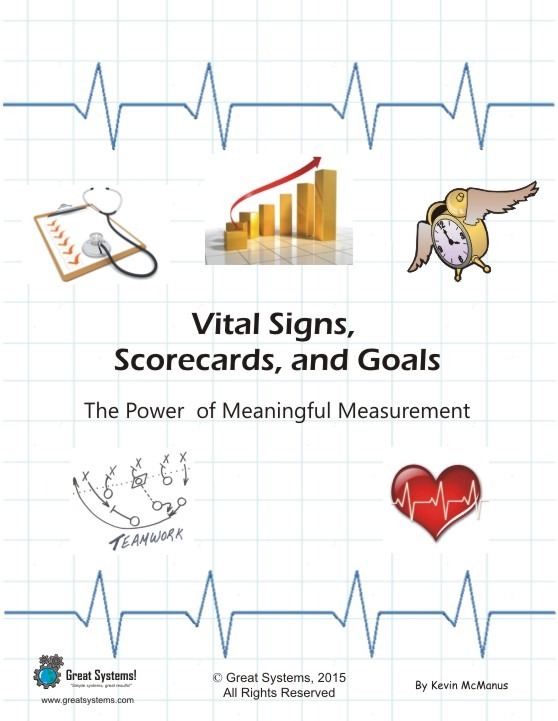 Kevin also writes the monthly performance improvement column for Industrial and Systems Engineering magazine, and he has published a new book entitled “Vital Signs, Scorecards, and Goals – the Power of Meaningful Measurement." Buy this NEW measurement book by Kevin! Buy my NEW book on pursuing process excellence!